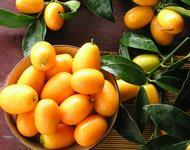 Harvest Season: April through October The origin of Kumquat, originally named “Jingan” or “Jinju” or “Neonaigan (milk orange), can be traced back to the mountain area of Jiansi Province, China. The plant can reach a height of 7 meters, with oval leaves. Its flowers are white with 5 petals, producing an edible fruit which is either round or oval in shape, golden in color, and is as big as the thumb. The outer skin of the fruit is sweet and has a unique aroma. It is best served in candied form. The flesh is sour tinged with a slight sweetness, and is believed to have the quality to suppress the cough, soothe the sore throat, and beautify the skin. It is the best material for making preserved fruit. 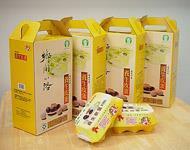 The Kumquat cake was one of the delicacies of the Cing court and was introduced to Yilan during the Daoguang Period. After more than 100 years, it has taken its root here and is ranked first among the 4 treasures of Yilan. Harvest Season: March through December The white stemmed, large leaf breed of water convolvulus was introduced by the Taoyuan District Agricultural Research & Extension Station in 1980, and has been favored by consumers for the past 20 years. With a harvest season extending from March to December, this hot spring water convolvulus is specially characterized by thick stems, large leaves, and its tender yet crispy quality, together with its green color, which it retains even after being cooked. 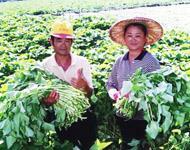 Harvest Season: April through October Dongguang No. 3 variety was exclusively selected to be planted in this area with harvest season falls from April all the way through October, and peaks between May and July. The outer skin of the hot springs sponge gourd is of a beautiful green, the flesh is of a firm yet tender texture, and would not go dark when cooked. Harvest Season: September through November The harvest season for these delicious water oats falls between September and November. Because of their rather short harvest period, as soon as they reach the market, they are immediately snapped up. The water oats are very white and tender, with no black coloration at the core. Simply boil them in water to enjoy their delicious sweet taste. Harvest Season: January through April The special hot springs tomatoes produced between January and April in Yilan are of the Fanshih variety featuring bright, shiny red colored skin and flesh, with a special soft and sweet taste. Harvest Season: The total cultivated area in Jiaoxi for organic rice is 38.9 hectares, with a yield of between 5,000~6,000 kilos per hectare. 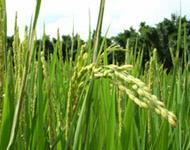 Natural animal and vegetable organic fertilizers, free of chemicals, are applied to cultivate the rice. A biological approach is used to prevent crop disease and pests, which totally eliminates the need for pesticides. Irrigated with pure unpolluted water, this premium rice has become very popular on the market. Harvest Season: The Jiaoxi tea production industry was established by the Han settlers in the Cing Dynasty. 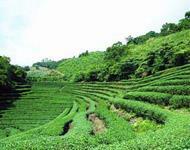 The major plantation area is concentrated around the Wufongci Mountains, granting it the name of Wufong Tea. The special attributes of Wufong Tea are its distinct aroma and delicious taste. 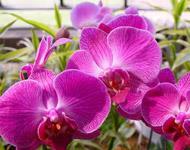 Harvest Season: The cultivation of the Moth Orchid (Phalaenopsis) is an emerging agricultural industry. By virtue of the fact that the Taiwanese Moth Orchid (Phalaenopsis) is ranked as one of the most popular flowers worldwide, and enjoys a good reputation for its unique variety and stable quality, it is potentially a high-end export flower. To accommodate Japanese tastes, the Moth Orchid grown in this area is purposely selected for thick petals, round, and complete flowers. Harvest Season: February through July Tomatoes are rich in nutrients and vitamins, and can be served as either a fruit or a vegetable. The tomato plantation in Luodong Township is near the Luodong Sports Park. The harvest season here falls between February and July. 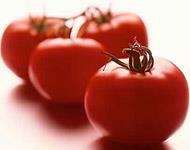 The tomatoes have been conferred with GAP labels stating that they are safe and healthy for consumption. Harvest Season: Pineapple, a native fruit from Brazil, South America, is called “Wanglai” in Taiwan, because in Taiwanese pronunciation, these words sounds like “prosperity has come”, making it the choice gift for celebrations and festive occasions. Outside of the delicious fruit, the pineapple also makes a great appreciation plant with its large, pointed leaves, and light purple flowers. 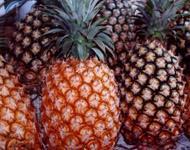 Fresh pineapple is sweet and juicy, great for protein digestion, and is a popular fruit in Taiwan. Pineapple leaves can also be used for making fabrics and paper. Harvest Season: The Yuanshan Leshan pear is a new product of the High-Grafting Pear Production/Distribution Unit of both Tongle and Jhenshan Villages. The so-called high-grafted pear comes from binding a piece of Hengshan pear inside a cut of a wild flatland pear plant. 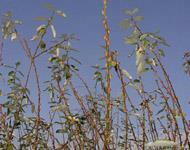 After 3 to 4 years, a further graft to the highland pear plant results in the so-called “high-grafted” pear. 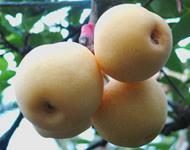 The total cultivated area of Leshan Pear is about 30 hectares. 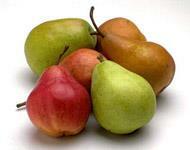 The pear is very sweet, with delicate and flavorful meat. Harvest Season: The Hami melon, native to the Hami Region of Sinjiang Province, has found a new home here in Jhuangwei, Yilan. The soil downstream of the Lanyang River is great for the cultivation of hami melon because of the plentiful sunshine, excellent water system, and the local mild weather. 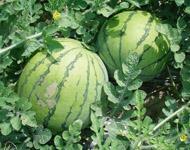 The Hami melon was introduced to Jhuangwei in 1982. The current cultivation area is 45 hectares, with a yearly output of 94 tons. The market price is reasonable. 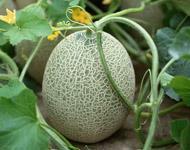 The melon is oval in shape, has a light yellowish green outer skin, and sweet and crispy meat. With its distinct aroma, and juicy taste, it's a choice summer fruit to enjoy. Harvest Season: December to March The variety of white garlic is determined by the quality of soil and climate of a region. The specie of garlic chosen to be cultivated in this area is known as “Pu garlic”, which belongs to the hard stem species and is especially suitable for early cultivation. The other variety grown in this area is “Hua garlic” featuring tender and broader leaves. It is suitable for later cultivation. 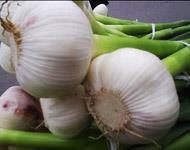 The garlic is usually planted in late August, and can be harvested from the beginning of December all the way through March of the following year. Most of the garlic produced in this area is shipped to markets in Taipei. Harvest Season: Lunar calendar months of May and June The total watermelon cultivation area in Wujie is approximately 100 hectares. The harvest season falls on May and June of the lunar calendar. The watermelon is the cheapest and juiciest fruit of summer. Harvest Season: Year Round Established in 1964, the Yang-Sheng (Heath Promotion) Food Factory is famous for its production of Yang-Sheng Soy Milk and Yang-Sheng Thousand-Year Old Eggs. Made of selected soybeans and brown sugar, the Yang-Sheng soymilk used to be a cheap yet nutritious snack for farmers during the busy farming season. It was also an essential nutrient supply for children from agricultural households. It is tasty, healthy, and best served chilled. The Yang-Sheng thousand-year old egg is produced using a unique recipe that is lead free, high in nutrients, and of superb quality. This tasty egg is believed to increase your appetite, and help digestion. Because of it is high iron content, it can help in preventing anaemia. 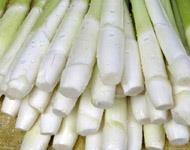 Harvest Season: The green onion cultivated in Jhuangwei is mainly of the “Jioutiaocong” variety, with long, thin white part and a large green part. The stem is tender and juicy, conforming to modern day tastes. 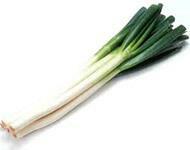 This green onion variety is cultivated by separating the sprouts. Farmers use a planting tool to dig deep and narrow holes on a hay-covered hump and insert 2 to 3 green onion sprouts into each hole. The green onion is ready to be harvested when 9 –1 0 sprouts appear. Harvest Season: December, January & February The Silver willow, or cattail willow, cultivated in Mainland China and Taiwan totals 257 different varieties. They are best cultivated in an airy place with moderate sunshine, a soil temperature of 20 Centigrade degrees, and a humidity between 80 to 90 degrees. The silver willow plants can grow as high as 4 meters, however to be used in flower arrangement, they are usually cut down at 2 meter height. Introduced from Japan in the 1970s, and after continuous research and development, Sansing Township began the mass cultivation of silver willows in the 80s, with a total cultivated area of 70 hectares, supplying 95% of the island market. The harvest period for the silver willow is from December to February of the following year which coincides with the Chinese Lunar New Year. Because the silver willow’s name in Taiwanese sounds like “yin-liang (money)” it enhances the festive atmosphere, making it one of the Chinese New Year’s staple plants. Harvest Season: July & August The General’s Pear produced in Sansing uses a high-grafting technique to produce great quality pears. Because the name of Sansing (tri-star) is equivalent to the name of the rank of a military general, therefore the name “General’s Pear” is given to these special pears. 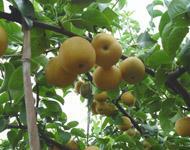 A total area of 120 hectares of rice fields was converted to the cultivation of these high-grafted pears. The weather and abundant rainfalls of this area have contributed to the juicy and crispy characteristics of the General’s Pear. During its harvest season in July and August, all tourist orchards are open to the public for fruit picking and purchasing. Harvest Season: May through November Overlooking the Pacific Ocean from a distance, and located at the intersection of Syue Mountains and Nanhudashan (Nanhu Great Mountain) at 800 to 1,000 meters above sea level, Siji Village and Nanshan Village of Datong Township are especially ideal for growing high elevation vegetables because of the abundant water supply and mild climate of the region. 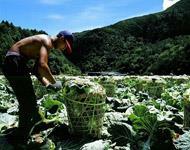 The total cultivated area is 300 hectares, with major produce including cabbage, Chinese cabbage, and spinach. The harvest period is year-round and peaks between May and November. The vegetables harvested here supply for the whole island, especially during the summer time. Harvest Season: Lanyang Wunong Rice is cultivated using the excellent varieties of Tai-Ken No. 8 and Taichung-Shan No. 10 strains of rice. The most advanced computer-operated rice-husking machines are used to sort out grabbles and broken grains to guarantee quality. The rice is stored at a low, 15 degrees Centigrade to preserve freshness. The rice is of superb quality with a distinct aroma, and a soft, tasty flavor. 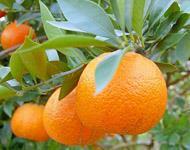 The Tonggan mandarin orange is harvested around the Chinese Lunar New Year. Because of its round shape and golden color, which symbolically represents granting wishes for a full and prosperous New Year, it is also called Niangan (New Year orange). The Tonggan has a moderate sweet taste sometimes with a slight sour flavor. It can be stored for a long period of time. With its long harvest season and consistent maturing period, it is the best fruit choice for the whole family. Harvest Season: The foothills of Dongshan Township provide a perfect environment in which to grow tea trees because of the abundant rainfall, high humidity, good soil, and appropriate sunlight. The tea cultivated here is tender, aromatic, without bitter or tart taste, and of supreme quality. The name was given by former Secretary General Chiang, Yen-Shih accounting for its superb properties. Susin tea is semi-fermented, and is mainly of the Oolong variety. Baojhong tea is less fermented with bright green colored tea leaves. When brewed, the tea is honey-green to golden-yellow in color, and has a delicious and wonderful taste. The Oolong tea is more fermented with green/yellow colored tea leaves, like flowers. When brewed, the tea is amber in color, and has a delicious fruity taste. 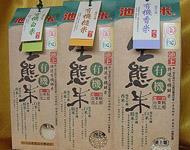 Both teas are delicious and can be brewed several times over, and are popular among tea lovers. 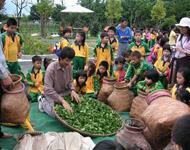 The annual production of Susin Tea reaches approximately 600,000 kilos. After the continuous effort of devoted tea farmers, tea garden management, tea production techniques, and tea packing and image promotion of this area have all reached a rather high level, winning the local tea farmers several medals in various national tea making contests. Harvest Season: September, October The pomelo plant blooms in early summer with little white flowers which turn into oval fruits in autumn with thick, rough and yellowish skin and white meat with a sour taste. 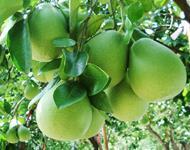 The main pomelo plantation area in Dongshan Township is mainly at Dajin, De-an, Jhongshan, Taihe and Anping. The pomelo variety grown in this area, after improvement, has produced fruits with a rounder shape, yellowish meat, and an increased sweetness and flavor. The harvest season reaches its peak between September and October. Harvest Season: The major bamboo cultivation area in Dongshan is concentrated at Linlikeng in Dajin Village. 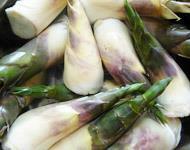 The bamboo shoot produced at this area has a fine and delicate texture and a sweet taste, and is best served as a cold salad. Harvest Season: The main plantation areas for the Shanshuei Pear concentrate around the foothills of Anping, Jhongshan and Dajin, totaling approximately 30 hectares. Because it adapts well to the mild weather, humidity, and water resources of this area, it soon enamours farmers. The name justifies the good mountain and water of the Dongshan area where these big, juicy and sweet pears are cultivated. Harvest Season: The Shanyao (Chinese Yam), or Tianshu, or Shanyaoshu, is called “Haishan” in traditional Chinese medicine language. The main varieties growing in this area are of Shoufong and native species with a total cultivation area of 15 hectares. Outside of its high starch content it is also rich in protein, minerals, and various vitamins. It is also believed to have magic healing properties for stomach and nose bleeding, high blood pressure, kidney disease, and cancer. It is best served uncooked. 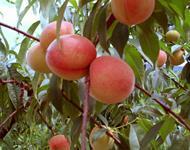 Harvest Season: May The Tainong Sweet Peach is the newest variety of high-end economic fruit product. 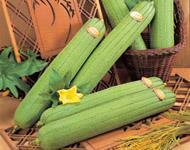 It is suitable for cultivation on flat land and has adapted perfectly to Yilan’s weather. The harvest period begins in May, with a high yield of between 100 to 300 counts per tree with each count weighing between 100 to 150 grams. 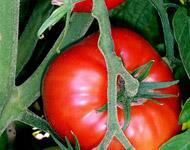 The outer skin of the fruit is bright red, while the flesh is white in color. It is very sweet and has a distinct flavor. It is soft and juicy. 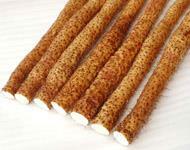 It is great both as a snack and as a gift.